Note: this is a sponsored post by Swim Right Academy. All reviews and opinions expressed in this post are based on my personal view. I want to thank Swim Right Academy and Aiden’s instructor, Christie, for being a part of our swimming journey. 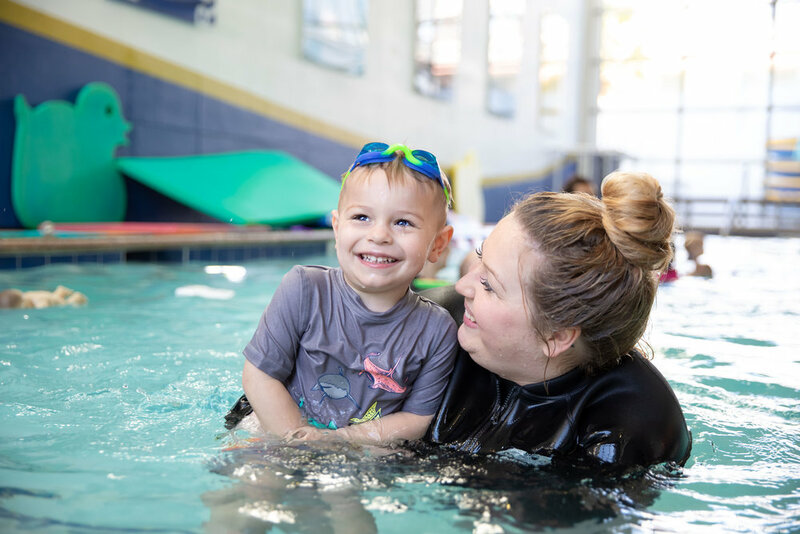 I enrolled Aiden in mommy and me swim lessons at Swim Right Academy in Los Angeles when he was five months old because I noticed he had an affinity to water. Bath time has always brought him so much joy and even in my belly, when I started swimming around seven months pregnant, I sensed he loved being in the water as much as mommy. Aiden adores his instructor Christie. She knows just how to encourage and push him to get the best results. To this day, it is one of the best decisions I have made as his mom. Now, as a toddler, Aiden is still a happy little fish in water. He has excelled at kicking and holding his breath under water and continues to learn so many life saving techniques which in turn creates a more confident mama (as we are often around water in California). But what has this experience been like for a busy boss mama and what valuable skills did we both learn in the process? Let’s face it, whenever we commit to something that requires us to show up regularly, it can be hard. For me, juggling swim lessons on a Monday morning as a busy boss mama has not always been easy! Many days I would feel overwhelmed with getting to the lesson on time (especially with an opinionated toddler) having to let go of the emails and to do’s piling up during the session. 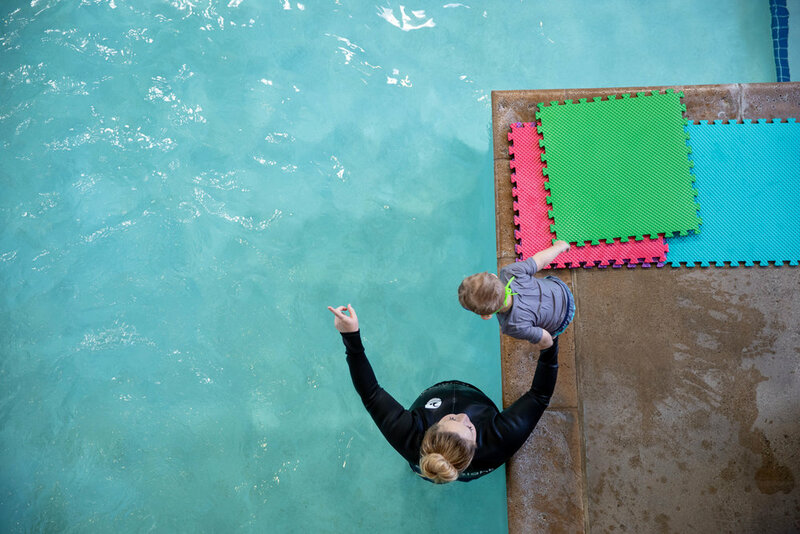 But what made it easier was seeing my son’s face light up as we entered the pool and his eagerness to jump in with his favorite instructor, Christie. That is when I am able to get in the right mindset of being there. I guess it is kind of like going to the gym. Hard to get there sometimes, but the energy you get after, makes it totally worth it! Positive reinforcement and focusing on strengths is so important for our little ones. I chose Swim Right Academy because our friends referred us and mentioned how happy they were with the instructors and overall teaching methods. I also liked the fact that it was started in 2005 by four time Olympic Gold Medalist Lenny Krayzelburg. I decided to do a test and signed up for a free mommy me class (now known as Parent Tot classes) to have a hands on experience with the process. Aiden really enjoys activities which involves kicking. Mommy me sessions are taught in a small group of parents and children of similar age and one instructor. The class helps to establish comfort in the water and is a great way to bond with your child. Parents are taught how to correctly hold their child in the water, the correct way to take them underwater and the importance of the back float. The session is taught using songs and games that introduce what the child will soon be learning later in private lessons. We had a great trial class so we decided to sign Aiden up for weekly classes which you pay for on a monthly basis. Personally, my favorite part of mommy me lessons was getting one-on-one time with my son engaging in an activity that has always brought me joy too. As a child, I started swim lessons around age five and swam competitively for a little over ten years. To this day, when I smell pool chlorine it takes me back to swim meets and other happy water memories. My hope is that these mommy me moments will hold great memories in Aiden’s mind as he grows older (hopefully the digital photos and videos will help with this). Hard to believe this memory was captured during a mommy me session when Aiden was only 7 months old. Time really does go by so fast. Beyond the bonding time, I believe it is a great way to encourage freedom and establish trust in your relationship. The first time you push your child under water so the instructor can catch them and teach them to roll onto their backs, is a bit terrifying. Even being accustomed to the water, I was nervous for my child’s safety and couldn’t help but gasp a bit when I let go the first few times. But these moments prove the importance of cutting the umbilical cord. The sooner you start, the easier it becomes as they grow older and it can only help them with developing confidence, independence and other life skills they will need as adults. Not to mention the trust it takes from both sides - as a parent to let go and know they will be okay and as a child to know you have the space to grow but are protected if something scary should happen. 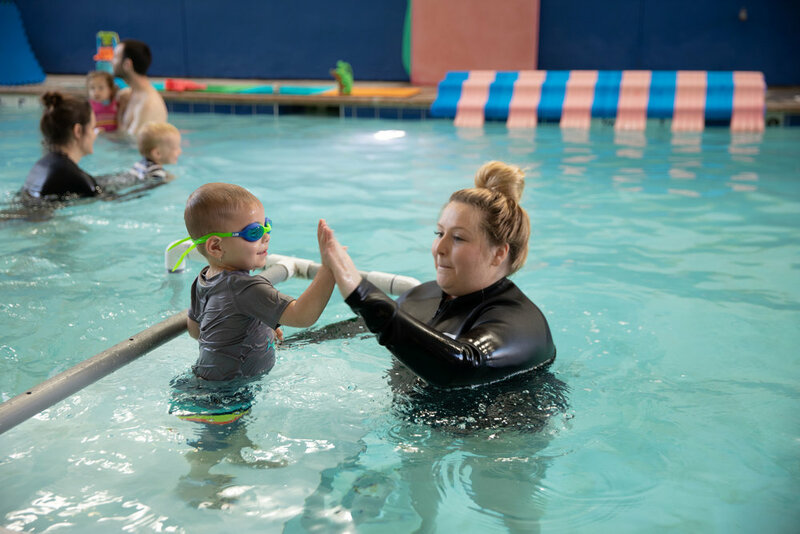 As Aiden developed his comfort with the water, around twelve months, it became time for him to start private lessons without mommy in the water. Here is where the trust expands to strangers. In our case, it was the same instructor so there was some familiarity, but it still was an adjustment to not having me in the water with him anymore. It took a few sessions before he was calm enough to actually have a lesson. And I will admit, it was extremely hard to experience this as a mother. But Christie was so good with him and I knew it was good for his development so I tried to focus on giving him his freedom so he could develop independence. Which coincidentally also made dropping him off at daycare for the first time a little easier a few months later. Private lessons would actually be more difficult than I imagined, but also valuable in many ways. First, there is the fifteen minutes of downtime you have while your child is in the water learning to swim. Do you use this time to catch up on emails or should you be fully present instead? What a dilemma this would be until I realized what worked for me and gave me less guilt - being fully present. I knew how important it was for Aiden to have mommy as a cheerleader and for my family as this meant I was able to document these special moments. So I committed to being fully present until after he was dropped off at daycare. I made a commitment to show up during his lessons so I can be involved and document the moments for lifelong memories. The next challenge was not comparing Aiden to other children his age who seemed to be further developed, especially with back float. At first I was worried something was wrong and concerned that he wouldn’t learn the most life saving technique there is. That is when I decided to bring it up to his instructor, Christie, and I am so glad I did. Her feedback reassured me. She said she was not overly concerned since he was excelling at other things (swimming under water and kicking) and that with his personality type and high energy it is quite common that the back float is a bit more challenging. This was a good reminder for me to implement what I had coached leaders on for years - focus on people’s strengths to maximize their potential. However, this is a lot easier said than done so I was happy that Christie also provided some great tips and tools for us to use at home to start building a solid foundation for the back float. Things like counting to five while changing his diaper and explaining that this is just like in the pool when he is floating on his back. And as his comprehension was getting stronger I started to have “pep talks” with him before swim class. These talks would not only focus on what he is doing well but also encourage him to hold the back float so he can save his own life. It was amazing to see how these tricks were actually having a positive impact on his lessons which created more confidence on both sides. It also proved how important communication is, even in the early years, when you think they aren’t really listening to you. The reward is when you see them implementing what you discussed in the next lesson. Even though I was the one that initiated these swim lessons, it was important to involve my husband, Janne, as much as possible. The biggest reason being that we are a team. And I quickly learned the best way to involve Janne (a visual learner) was for him to participate in some of the classes to get a firsthand experience of what is going on. When Janne wasn’t as involved, there were challenges, especially when we were around water. He would start to play with Aiden in ways which would sometimes go against what we were teaching him in the swim lessons. After he participated in a few sessions, he became more aware of the importance of implementing certain techniques (roll into back float) even during fun swim time. This made a big difference in Aiden’s focus during swim lessons. The only downside of involving Janne was that mommy missed out on Aiden’s first trophy experience. I guess that is how it goes ladies - we do all the hard work and the man gets to reap the rewards (LOL). After every class, our instructor will give Aiden a sticker and then talk to us about the session and anything we can work on between sessions. Although every child is different, and some may not take to water as well as Aiden did, I do believe that as parents it is important to pay attention to our child’s passions and start at a young age to build upon them. Not only will your child be happier but you will both learn a lot from the experience which in turn can only create a stronger relationship. If you are considering swim classes, I hope my experience and lessons learned provide you with some things to think about along the journey. And I highly recommend for you to check out Swim Right Academy - they have multiple locations across the country. We could not be more pleased with our instructor and the overall core mission of the organization - which is focused on teaching and inspiring children to be water safe. If you are curious and have more questions - check out their FAQ. Aiden is so happy in the water that we are grateful for how easy it is to take him to swim lessons. Have you started your child in early swim lessons? What has your experience been? Please leave a comment below!